The United Federation of Planets, also referred to as the Federation or UFP, is an interstellar nation composed of planetary governments and Federation colonies. The various members of the Federation are organized under the unifying goals of universal liberty, equality, peaceful coexistence, trade, science, exploration, and mutual defense. Its territory encompasses at least several dozen sectors in both the Alpha and Beta Quadrants, spread across nearly 8,000 light-years of space. In 2268 there were at least 30 members , and by 2373, there were more than 150 members of the Federation, and over 1,000 semi-autonomous colonies. Many of the Federation member worlds were originally Human colonies, which is why Humans make up the majority of Starfleet personnel. The Federation is one of the most powerful interstellar states of the Alpha Quadrant. Unlike the vast majority of other major and regional empires, where power was derived from a single dominant race that subjugated other nearby planets and species, all members of the Federation joined willingly and coexisted equally with other members. Although its multispecies origin has caused it to be labeled a "mongrel" power by some outsiders, its diverse origins have also given it a unique strength over the past 200 years. The Federation is also famous for its technological resources and personnel. In particular, Federation engineers were respected as masters of technology repair and modification, even by enemies of the organization, such as the Dominion. The Federation was founded in 2161, in San Francisco on Earth shortly after, and partially as a result of, the end of the Earth-Romulan War. The seeds of the Federation sprouted during a temporary alliance in 2154 during the search for a Romulan drone ship. That was when Vulcans, Humans, Andorians and Tellarites first united for a common cause. This led to the founding of the Coalition of Planets a year later, when United Earth, Vulcan, the Andorian Empire, Tellar, Denobula, Rigel V, Coridan, and several other worlds united in a common economic union. The Coalition continued towards unity over the next several years, and this ultimately led to the formation of the Federation after the Earth-Romulan War. Although the Federation's intentions were peaceful, its policies of expansion almost inevitably brought it into conflict with other states in the region. In the 23rd century, the most notable conflict was with the Klingon Empire, and war briefly erupted in 2266, before being halted by the Organians. However, this tension eased considerably towards the end of the century, with the Khitomer Conference of 2293 being a substantial turning point. As the 24th century started, the Federation began an unprecedented period of peaceful exploration of the galaxy, without any major conflicts along its borders. Throughout this period, the Federation remained in a state of low-level conflict and cold war with the Romulan Star Empire following the Romulan re-emergence on the astropolitical scene in 2266. A series of local conflicts flared in the late 2340s, with the Federation encountering races such as the Cardassians, the Talarians, the Sheliak, the Tholians, and other minor regional powers like the Tzenkethi. These conflicts were short-lived, in no small part due to the power exerted by Starfleet at that time. But the darkest period in Federation history was soon to arrive. First contact with the Borg Collective led to a series of attacks on Federation outposts. The Battle of Wolf 359 saw Starfleet dealt a crippling blow, it took many years to even partially recover. The Federation soon learned that the enemies they had dealt with in the past were nothing compared to the powerful forces found elsewhere in the galaxy. In the 2370s, contact was made with the Dominion, the ruling power of the Gamma Quadrant. After numerous skirmishes, the Dominion allied itself with the Cardassian Union, and launched an invasion of the Alpha Quadrant. The Dominion War that followed was the greatest crisis in Federation history. Although the Allied forces eventually emerged victorious, many of the Federation's important member worlds - including Betazed, Coridan, and Benzar - had been temporarily occupied before the Dominion's offensive could be turned back. Thousands of starships and millions of lives were lost, in what was the most bloody conflict in Federation history. However, the war and its aftermath allowed the Federation to establish new relations with many of its former adversaries. In particular, it was hoped that relations with the Romulan Star Empire would improve, marking the beginnings of détente with a traditional enemy of the Federation. In the early 2380s, the Federation made an accidental discovery of the Route of the Ages in the Delnevorian system, which sent the //U.S.S. Explorer// some twenty million light years away from home to the Tatoo system, in another entire Galaxy. After discovering that the Route was indeed stable, the Federation began to explore this galaxy. By the end of the year 2382, the Federation had made contact with several extragalactic races, and had allied themselves with the New Republic. However, the Federation also began meeting a number of threats at an unprescidented rate- -chief among them, were the Cylons, which showcased a new kind of automated threat. Thankfully, Starfleet's preparations against the Borg and military strategies involved therein allowed them to fend off the Cylons until a proper fleet could be arranged. In response to this, a formal treaty was signed with the New Republic, the Treaty of Naboo. This treaty granted the Federation a 30-planet wide bredth of space in the Outer Rim to explore and use to establish a base of operations. This space, known roughly as the "Federation Expansion", or "Federation Protectorate" steadily expanded throughout 2382. By Febuary of 2383, there were almost ten colonies scattered across eight different solar systems. Following the Treaty of Naboo, the Federation adopted a similiar treaty with the Dread Conglomerate. On the day the Naboo Treaty signing, however, Starfleet officers made first contact with the Goa'uld, a race of advanced alien beings who believed themselves to be gods, and used human beings as slaves and biological hosts. Though the Federation first got involved by simply being in the way of an angry Goa'uld warlord during an attack on Tatooine, word quickly spread that the Tou'rii had returned. Evidentally, Earth, the capital of the Federation, was once a Goa'uld slave world. The Goa'uld's violent insistance on servitude clashed directly with Federation ideals, and several attacks were launched into Federation space. Around this time Starfleet began to uncover proof of an existance of a type of wormhole-connection network across the galaxy, one that the Goa'uld utilized heavily. Later, a scientist from the Tatoo system, Seiji Dai, would use the Stargate to help the Federation establish one of their first extra-galactic outposts, on the city-ship known as Atlantis, located in the Pegasus Galaxy. In 2382, with the help of Zon Huntreas, Starfleet was able to discover a repository of knowledge of the race of Ancients that built these so-called StarGates, proving it was not the Goa'uld. However, this knowledge was downloaded into the Captain's head, which caused him to slowly lose his mind. Though he eventually recovered by making contact with a race known as the Asgard, he successfully gave Starfleet Command a virtual map of thousands of worlds with gate addresses, some in different galaxies. After this discovery, Starfleet immediety began to form a special unit designed to explore planets without the need of warp drive. However, the real threat began in 2383, when the System Lord known as Ra began to destroy colonies along the Expansion. This pressing matter and Cold War against the Goa'uld has kept the Federation from engaging in many extra-galactic politics across the outer rim. Likewise, StarGate exploration has been stalled, due to concerns of violating the Prime Directive, despite the fact that most races encountered would be considered human colonies. After a short and disruptive war with the Goa'uld an organization known as the Peacekeepers entered the war and began driving off Goa'uld interests. The Federation chose to stay out of the Goa'uld Peacekeeper War and was able to continue it's exploration unabated, save for a few encounters with the Cylons. The next major conflict came during the end of 2385 when Edge Koenig declared himself the new Emperor of the Galactic Empire and utilized Ancients technology as well as the manpower of the Imperial Remnant in an attempt to wipe out all life in the galaxy. Captain Zon Huntreas was chosen to lead the combined fleet against Koenig's forces, which consisted of not only Federation, but also Republic, GWAM, Peacekeeper, Dread Conglomerate, and even loyalist Imperial forces. Following this encounter, there were numerous boarder skirmishes along the edge of the Protectorate involving the Peacekeepers. In May of 2385, The Peacekeepers attempted to bring in a large fleet through the Route of the Ages in order to overtake the Tatoo system and then plow into Federation space. However, Starfleet Intelligence was able to discover their plan and enact a self-replicating minefield over the Route, which destroyed the fleet. Harkonnen forces spent weeks trying to remove the mines, during which the Federation Protectorate had to rely on itself, having been cut off from the Alpha Quadrent. In June of 2385, the Federation had it's second run-in with the Cylons when the robotic fleet took over the planet Tatooine. Captain Zon Huntreas again came to their rescue, destroying twelve Basestars in a single engagement. Ever since then, the Federation has attempted to strengthen it's ties to Tatooine, removing the minefield. By the turn of 2386, the Federation had established formal ties with the Kukai Foundation, and established a peaceful presence just outside the Route of the Ages. The government of the Federation is organized as a federal republic, where the member planets and colonies formed semi-autonomous districts. Central authority in the Federation is delegated to the three branches of the Federation government: the Federation Council, the legislative branch of the government; the Federation President, the executive and head of state; and the Federation Supreme Court, the supreme judicial authority . The Council in 2286 met in San Francisco , while the President's offices were located in Paris. In it's origin galaxy, the Federation stretched over 8000 light years of space, and had continued to expand following the Dominion War. After the Treaty of Naboo, The Federation was generously 'given' a wide cooridoor of space near the New Republic's Outer Rim territories to help grow and explore. Due to the nature of warp over hyperspace travel, Starfleet has discovered a number of different, uncharted star systems, many uninhabited. 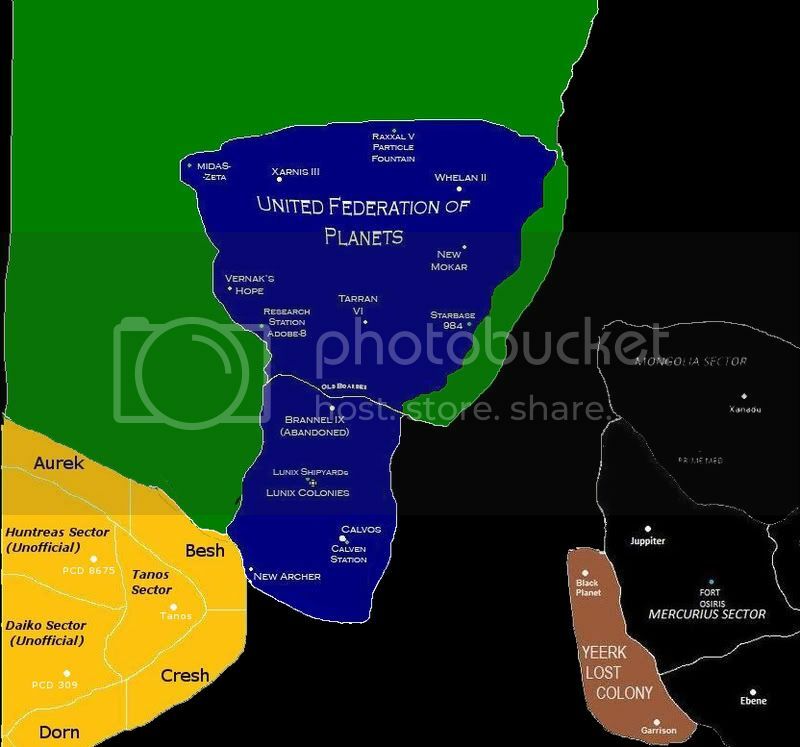 This "Federation Expansion" is divided into two major sections- -their main territory, which includes a total of ten inhabited star systems and another six outposts, and the "Federation Protectorate" that was given to them, in which they concentrate the majority (but not all) of their exploration. Due to their diversity, the Federation has a large number of different weaponry at it's disposal. However, their main weaponry generally includes phasers, photon, and quantum torpedoes (more information to come). Starfleet marines are a small, marginalized force that are rarely deployed. Most Starfleet officers obtain limited ground troop training. In recent years, small, mobile "Hazard Teams," fitted with the latest in high-tech 'hazard suits,' have been trained on deep-space vessels such as the U.S.S. Voyager, U.S.S. Explorer, and U.S.S. Enterprise. Federation maritime vessels are generally left to planetary defenses, and as such, each member planet's defenses are slightly different. Some planets, such as Vulcan, perfer to utilize their own resources and shipyards, while others, such as Earth and Betazed, use more homogenized Starfleet technology. Interesting for a spaceborn faction, the Federation had no dedicated military fleet. Instead, all military actions are carried out by their exploratory organization known as Starfleet. While Starfleet's ship deployment ranged from pure science vessels to "heavy threat deterrents," they only had two real 'warships' on their books: The Defiant Class and the Prometheus class, both of which were capable of, at least, some scientific merit. One of the most popular vessels was the Galaxy class long range deep space explorer. The Federation has a massive economy, built around large scale, inexpensive production of almost all consumer goods. No money was used for basic expenses, such as food, clothing or shelter. The basic unit of exchange was the Federation credit. Advances in technology and a drastic shift in public attitudes towards wealth made traditional currencies obsolete in the 22nd Century, ushering in the New World Economy. The introduction and advancement of replicators during the mid-to-late 24th century drastically changed the orientation of the economy, as matter-energy conversion reduced the cost of most small- to medium-scale objects to practically nothing. Large-scale construction was efficiently handled, as well. As many would have it, the driving force behind Federation society was no longer the acquisition of wealth, but rather self-enhancement and the benefit of all. Perhaps ironically, entrepreneurship was encouraged, although the primary goal of most ventures was no longer to make a profit. They were intended for personal enjoyment and improvement. The various systems of the Federation are generally rich in natural resources, although their intrinsic worth has changed as the replicators reduced the need for most refined and semi-refined materials. Other materials, such as latinum, which were more time and energy demanding, were often traded for with non-Federation planets. One of the most valuable minerals was [dilithium, which was critical in regulating the matter-antimatter reactions in the Federation's power generators. The Federation is a peaceful, largely pacifist organization which relies on compassion and democracy to help govern it's people. As of the 2380s they had over 200 member planets and over thousands of colonies. It is not uncommon, after a hundred years or so, to see a colony be granted independence and become a member planet of it's own. While highly respectful of the differences in the cultures of other races, to apply for Federation membership a planet would have to met certain criteria- -this criteria generally included a lack of sentient rights violations, and a free government. The exact form of government was often not called under question. Many races vye for the chance to join the Federation, due to the amount of resources, trade, and enhanced protection that they offer their members. Most of this page was stolen from Memory-alpha.org. Go there, it's a great resource! Due to the dangerous run-in while attempting to decypher an Ancient propulsion system which catapaulted the U.S.S. Explorer to the edge of the universe, the enigematic figure known as The Slider is wanted for questioning throughout Federation space.